From Christ We Draw the Strength Lacking in Ourselves. The Feast of Saint Mark, Evangelist. • I Peter 5: 5-14. • Psalm 89: 2-3, 6-7, 16-17. The Monday of the Samaritan Woman; a Postfestive Day of Mid-Pentecost;** and, the Feast of the Holy Apostle & Evangelist Mark. • I Peter 5: 6-14. The bottom line is that the Gospels were written in the order in which they appear in your grandmother's Bible: Matthew, Mark, Luke and John. But aside from the question of when it was written, an even more important fact about Mark's Gospel—and which we know also from the testimony of one of the Fathers—is that it is essentially the Gospel according to Saint Peter, and we know this from no less a source than Saint Jerome, about whom we've spoken before, and who knew more about the Bible than all of today's modern Scripture scholars combined. From him we learn that Mark and Peter were the best of friends, that it was at the request of Peter and the brethren in Rome that Mark wrote his Gospel; and, since he was not one of the Twelve Apostles,—though it's fairly certain that he knew our Lord personally—he based his Gospel primarily on what Peter had told him. 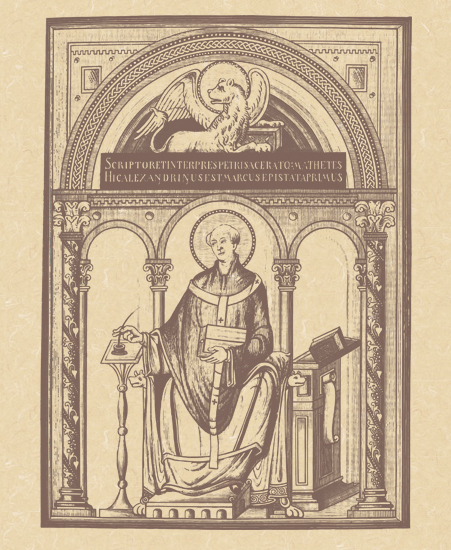 Jerome states: “When Peter had heard this Gospel, he approved it and gave it out to be read to the Church on his authority” (On Church Writers, ch. 8). In other words, Mark's Gospel is the first book ever written to carry an imprimatur, and it came from the first Pope, himself. So, I would suggest to you that the Feast of the Blessed Evangelist Mark is the prefect opportunity for us to renew our devotion to, and to pray for, our Holy Father. The notion that Mark may have personally known our Lord comes from an incident in his Gospel which is found in no other: it takes place during the Passion of our Lord, when our Lord is arrested in the Garden of Gethsemane. Just after Jesus is arrested, Saint Mark says, “There was a young man there following him, who was wearing only a linen shirt on his bare body; and he, when they laid hold of him, left the shirt in their hands, and ran away from them naked” (14: 51-52 Knox). It's a very mysterious sentence, and some have suggested that this young man was Mark, and that his inclusion of this incident was his cryptic way of providing a kind of signature to his Gospel. Mark traveled with Saint Paul during the latter's first missionary journey and was with the Apostle to the Gentiles at the hour of his death. It was there in Rome that he solidified his friendship with Peter, and it is primarily from his Gospel that most of the Scriptural proofs for the primacy of the Pope are to be found. According to Saint Jerome, after the martyrdoms of Peter and Paul, Mark went to Alexandria, which claims him as its first bishop, and where he, himself, gave his life for our Lord; and, in the year 825 his relics were transferred to the city of Venice, which also regards him as its patron saint, and where his remains are enshrined in the beautiful Cathedral which today bears his name. If we accept, as many do, that the young man who ran away in the Garden was Mark, then his example can be a great consolation to us as we contemplate the life of this holy Evangelist; because it means that, in spite of our weakness in the face of temptation and trial, we can trust in the Divine Grace and assistance of Christ and His Church, and that our defeats and our daily acts of cowardice, be they great or small, can help us to be more humble, and unite us more closely to our Lord Jesus, so that we can draw from Him the strength we find lacking in ourselves. * In the extraordinary form of the Roman Rite, the observance of the Greater Litanies is extraneous to the Feast of the Evangelist; it is, nonetheless, observed, and is similar to the observance of the Rogation Days observed on the Monday, Tuesday and Wednesday before Ascension Day, with the exception that the procession normally done at Holy Mass on Rogation Days may, on this day, be transferred to another day at the discretion of the diocesan bishop. 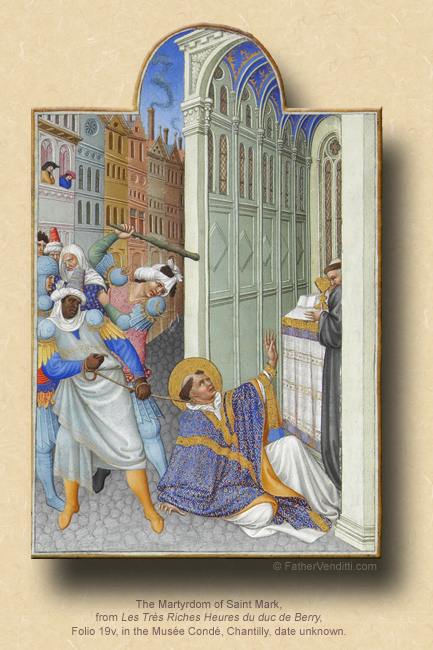 Nevertheless, those who pray the Divine Office according to the extraordinary form are required to pray the Litany of the Saints in Latin, with the accompanying psalm and penitential prayers, just as on Rogation Days. ** In the Churches of the Byzantine Tradition, the day known as Mid-Pentecost marks the exact half-way point between Pascha and Pentecost, and is one of the few days on the Byzantine calendar on which the office and Liturgy of any saints' day is suppressed. This year it was observed on April 20th. The week of Mid-Pentecost, culminating in "The Sunday of the Samaritan Woman," leads us to Jacob’s Well, where Jesus announces for the first time the doctrine of Baptism, the sacrament of Water and the Spirit, which is what the whole Paschal cycle is about. Our Lord’s resurrection from the dead and His ascension into heaven opened the gates of heaven and made salvation possible for us; and, the feast of Pentecost, which ends the Paschal season, commemorates our Lord sending His Holy Spirit, which makes this sacrament of Baptism work in us. By receiving the Holy Mysteries of Baptism and Chrismation, we receive the same Spirit that Jesus gave to the Apostles in the upper room in the form of tongues of fire; hence, we become a part of the body of Christ and heirs to the Kingdom of Heaven. *** The Gospels of Matthew and Luke contain word-for-word material found in Mark, but also common material between them not found in Mark. What is now known as the “Two Source Theory” posits that whatever is common in Matthew and Luke but not found in Mark must come from some source not yet discovered, to which the proponents of this theory have given the title “Q”; but, the theory depends on the presumption that, because Mark's Gospel is the shortest and the most primitive in style and content, it must therefore be the first written. By the same reasoning, an archeologist a thousand years from now, finding both a copy of Gone with the Wind and a "Reader's Digest" version of the same, would have to assume that the condensed version was the original, and the longer, more embellished one was a later redaction. A more respectful and faith-based explanation for the common material found in the Synoptic Gospels would be the fact that the events and words recorded there were seen and heard by the Evangelists when our Lord did and said them, and the Evangelists recorded them accurately. Among those trained in the 1970s and early '80s, any challenge to the two source theory is intellectual heresy, and any suggestion that Matthew's Gospel was actually written first is pious pap. They dismiss out-of-hand the testimony of Saint Papias, in the Second Century, that "Matthew put together the oracles [of the Lord] in the Hebrew language, and each one interpreted them as best he could," as well as that of Saint Irenaeus, who dates Matthew's Gospel stating: "Matthew also issued a written Gospel among the Hebrews in their own dialect while Peter and Paul were preaching at Rome and laying the foundations of the church"; Irenaeus, in fact, quotes from it. The pseudo-intellectual sophistry offered by the slaves to source criticism to discredit these statements is nothing more than a symptom of the post-conciliar desacralizing of the Word of God that is still popular in some quarters, not to mention an insult to two great Fathers of the Church, often accompanied by an assertion that it is not intellectually honest to engage in any kind of exegesis with reference to any other source or idea extraneous to the text itself; however, the fact that no original manuscripts of any of the books of the Bible are extent exposes this requirement as nothing more than a convenient way to ensure an already agreed upon conclusion designed to leave open the robbing of Holy Writ of it's dependency on the analogy of faith and the authority of the Church for its proper interpretation. The bottom line is that the Gospels were written in the order in which they appear in your grandmother's Bible, and the two source theory is nothing more than a relic from the '70s that ought to be buried with Sister Peggy's post-conciliar neon pink pants suit.